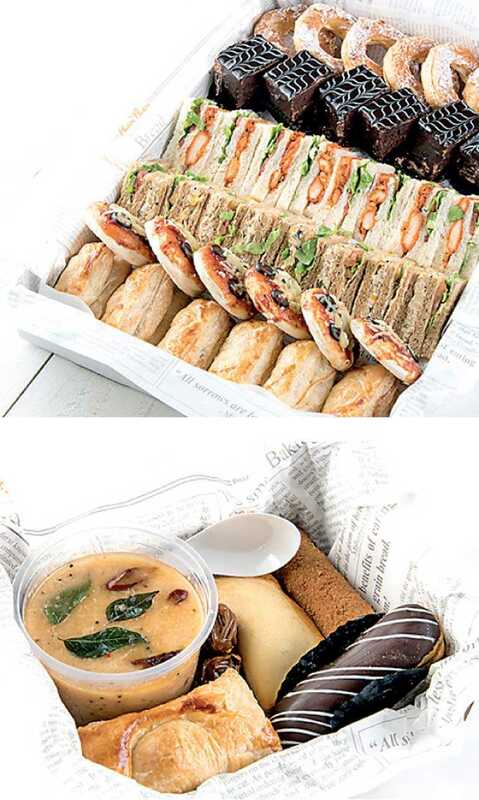 Paan Paan offers convenient Iftar packs for busy executives. Each Iftar pack contains three savories, one sweet, chicken kanji and three dates. These are available at each outlet from 4 p.m. onwards during the month of fasting. These come in a disposable pack and the kanji in a microwaveable container. It is priced at Rs. 380 per pack and contains everything you need to break-fast with. It is a convenient option for companies to order for their staff who may want to break fast at office or take back a convenient Iftar pack home. The set menu rotates each day so that there is a variation from day to day. The nourishing kanji is made with red rice, broken wheat and boneless chicken. A limited quantity is made each day and if a customer wants more than 10 packs, Paan Paan encourages the customer to order before 11 a.m. For customers who wish to customise their packs this option is available on pre-order. Kanji too is available separately for Rs. 130 a cup (350 g).Paan Paan also offers platters for Iftar. Customers can choose from the menu and decide the make-up of the platter or decide to take a set platter. Platters need to be ordered one day prior. Orders can be placed over the phone by phone on 7500225 or 7500226. Visit www.paanpaan.com.